Primarily used for all general purpose fume hoods and base cabinets, standard stainless steel countertops are fabricated of 16-gauge 304* stainless steel with a #4 smooth grain finish and are 1-1⁄4” (3.2 cm) thick and dished 3/8” (0.97 cm). A 4” integral backsplash comes standard and, when sinks or end splashes are required, they are continuously welded to the top and professionally buffed to a #4 finish. Countertop standard depth is 30” and can be made up to any length required to include a field joint or continual counter depending on the specific job requirements. The tops also have a rubberized sound deadening material applied to soften the sound of the top and make it more acoustically appealing. Rectangular 3” x 6” (7.65 x 15.3 cm) welded cup sinks are standard; locations must be specified when ordering. 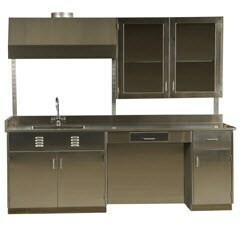 There are no threads in Air Master Systems Stainless Steel Tops, Sinks, Shelves Reviews at this time.